It was deemed too frigid Monday afternoon for the peace march from St. Bernadine’s parish in West Baltimore to walk the few blocks around the church where eight people, including a 7-year-old girl, were shot and killed just in the past year. 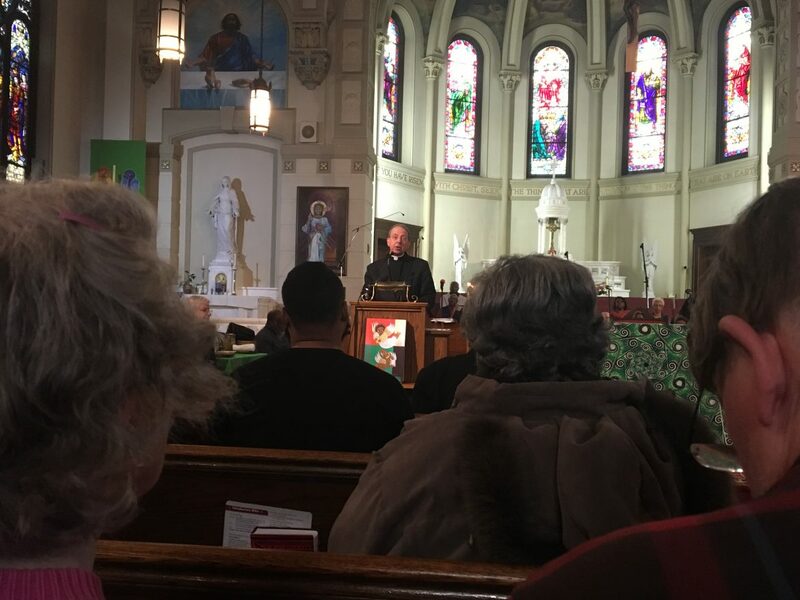 Instead, in honor of Martin Luther King and Monsignor Edward Miller, the deceased white pastor of this black Catholic church, we sang and prayed and listened to Archbishop William Lori. He condemned racism and acknowledged the complicity of the church in supporting it, including several of his 19th century predecessors who owned slaves themselves. The prayer service and march were originally billed as a simple affair where members of my parish, St. John the Evangelist in Columbia, would join with parishioners of our sister parish St. Bernadine’s for their annual march. Instead, when I parked on Edmondson Avenue, I noticed the first of several TV cameras and was soon greeted at the door of this old parish by the archbishop and other staff. Catholic clergy and laity are creatures of their time, flawed and imperfect instruments of the gospel. But the best of them could also be ahead of their time, desegregating Catholic schools before the public schools, marching with the civil rights protesters, advocating for social justice to the annoyance of their flocks. In Lori’s “pastoral reflection” on “The Journey to Racial Justice” he released yesterday, he acknowledges both past sins of the Church on race, and progressive leadership, with a pledge for more of that. It got me thinking of how I had likely benefitted, not just from “white privilege” but specifically from the actions of Jesuits, members of the Society of Jesus in Maryland, who taught me and with whom I served for three years. And who once “owned” hundreds of slaves. Specifically, Lori mentioned the first Archbishop John Carroll, an ex-Jesuit priest and founder of what would become Georgetown University. And Leonard Neale, “who later became Archbishop, was a member of the Society of Jesus who made decisions affecting the lives of the enslaved persons held by the Jesuits. “Records show that lay members, religious communities, and individual clergy held enslaved persons and that the Church benefited from their labor not only in general parish work – the maintenance of churches, residences, convents, cemeteries, and so on – but also from the profit of their labor on plantations and farms owned by Church entities,” Lori said. Jesuit priests accompanied Maryland first settlers, and the slaves worked the plantations they were given to support their work. Then came the shocking revelation a few years ago that 272 of these enslaved people “owned” by the Jesuits were sold to the Deep South in 1838 to help get Georgetown out of debt. 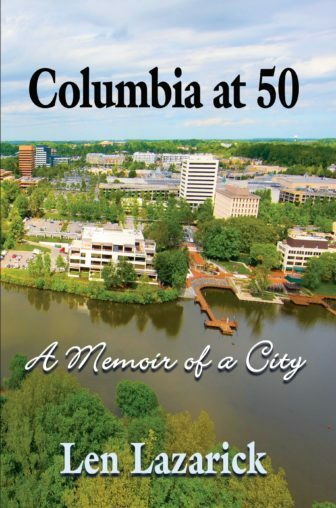 There are now an estimated 12,000 to 15,000 descendants of these slaves, according to a history of “Jesuit slavery” produced by Georgetown magazine, and many more who continued to live in Southern Maryland, where the Jesuits ran parishes until a decline in their numbers. Then comes a story I wrote for the Baltimore Examiner 10 years ago this month which I just rediscovered. “The Board of Public Works Wednesday gave final approval to the $57 million purchase of 4,473 acres of some of Maryland’s most historic open space, including 19 miles of Potomac River shoreline in St. Mary’s and Charles counties. “Along with 975 acres in Cecil County, the land has been owned for more than three centuries by the Maryland Province of the Society of Jesus, or Jesuits, the Catholic religious order whose members accompanied the state’s first colonists. Listening to Lori in St. Bernadine’s Monday, I wondered about that sale and I wonder how many slaves had worked those thousands of acres of Jesuit plantations, worth millions now supporting aging priests in Baltimore, Philadelphia and Washington. There were, of course, many Jesuits who worked to counter the legacy of slavery, prominent among them the late Father Horace McKenna, a true saint who could have been a scholar but instead ministered to African Americans for most of his life in D.C. and Maryland. As in so many things, the history of the Catholic Church and the Jesuits, its largest religious order, is a complicated one of sinners striving to correct their past sins. So we come back to the cold march we didn’t take around a few blocks in West Baltimore where eight people were shot and killed in 2018. “It was heartbreaking to put this map together,” said Monsignor Richard Bozzelli, pastor of St. Bernadine’s. But in the face of persistent sin and violence, there is persistent hope and the struggle for change, someday, somehow. The next peace walk will take place in February at St. Peter Claver, a church named after a Spanish Jesuit who ministered to South American slaves and is their patron saint.